The Samsung Galaxy Note 2 has been one of the hottest selling phablets since its launch. All major carriers in the U.S are offering it, and there have been over 5 million units sold since its release. The Galaxy Note 2 sells $299.99, on contract, at AT&T and Sprint. It costs $369 at T-Mobile with a contract. 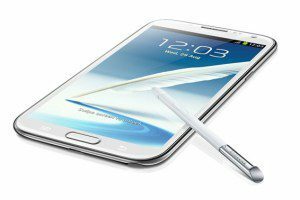 But over at Amazon Wireless, there’s a deal on the Samsung Galaxy Note II that drops the price down to $99.99 with a two-year Sprint contract. Unfortunately, the deal is just for new Sprint customers. Existing Sprint customers aren’t eligible. The Note 2 features quad-core 1.6 GHz Exynos processor, a 5.5-inch Super AMOLED display, 2GB of RAM, 16GB internal memory, 8 megapixel back camera, a 2 megapixel front camera, Bluetooth 4.0, Stylus S-pen and Android 4.1 (Jelly Bean). There’s a multi-window feature which has been a hit, with developers trying to port it over other devices. The deal at Amazon includes the White and Titanium versions of the Samsung Note 2 phablet. Will you be getting one at this price? Tell us your thoughts in the comments section below!